"I love the idea of Peeps®, but I am not a big fan of marshmallow. So as lemon bars are also sunny yellow, and way more delicious, I thought it only natural that a lemon bar Peep® should exist." Preheat oven to 350 degrees F (175 degrees C). Line a 9x13-inch baking dish with parchment paper. Beat butter and 1/2 cup sugar together in a bowl with an electric mixer until creamy. Add 2 cups flour and cornstarch; beat until mixture forms a dough. Press dough into the bottom of the prepared baking dish. Bake in the preheated oven until crust is light golden brown, 10 to 12 minutes. Beat 1 1/3 cups sugar, lemon juice, 2/3 cup flour, eggs, and lemon zest together in a bowl with an electric mixer until smooth. Pour lemon mixture over crust. Bake in the oven until lemon mixture is set, 25 to 30 minutes. Cool to room temperature before removing from baking dish. Cut into desired "Peep" shapes using shaped cookie cutters. 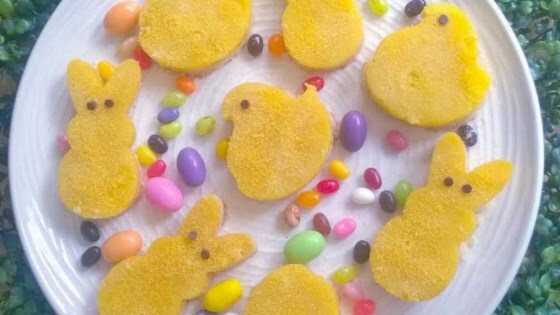 Place 2 mini chocolate chips onto each "Peep" to create "eyes." A sweet and tart Easter treat. The recipe was delicious, but making more of the lemon filling would have made it taste better. The lemon bars a tasty...however...the cookie cutter idea was a hot mess!!! I tried flouring them, I tried Pam spray, I tried dry, I tried wet. What I got was a messy goopy blob.